DEW = Detroit Engine Works. WMC = Wadsworth Manufacturing Co. DMCSC = Detroit Motor Car Supply Co. CEC = Columbia Engine Co. MSBC = Michigan Steel Boat Co. DBC = Detroit Boat Co. SMPC = Standard Motor Parts Co. CPMC = Caille Perfection Motor Co. MEC = Middleditch Engine Co. BGEC = Bessemer Gas Engine Co. T&MC = Termaat & Monahan Co. PIW = Petoskey Iron Works. (Updated: March, 2019) All literature & photo's copyrighted & protected by worldwide copyright laws. My fascination with the Detroit two cycle engines started when my father traded a old International Harvester LB stationary farm engine for a Detroit engine around the 1990 time period. At the time I don't believe dad new that he had traded for one of the very first low pressure fuel injected engines first invented in the early 1900's. After my father spent some time studying the engine and figuring out how the fuel system operated the engine was then completely restored. I remember the first time I seen the little Detroit engine run I knew I had to have one. I never seen a two cycle engine that would start so easy, run so good and was not loud and noisy. It would idle down and run as slow as a four cycle engine and you could even reverse the direction the engine was running with out stopping the engine. Changing the direction is done by slowing the engine to a very slow idle turning the ignition off and quickly advancing the timing then turning the ignition back on. This made the engine kick back in the opposite direction in which it would keep running if you quickly moved the timing lever back to neutral or top dead center. Some time between 1997 and 1998 I came across a 3hp Detroit that was for sale at our local antique engine swap meet. It was missing a few parts but I did not hesitate in purchasing the engine. This is when I first started collecting literature on DEW. Over the next few years I became more fascinated with the Detroit Engines and the companies history. Little did I know that I would end up researching and learning about many other companies in order to put some of the pieces of this puzzle together. Also researching information on marine engines which at the time I had very little interest in. There were so many un-answered questions about these engines and the companies that manufactured them. I guess that is what has kept my interest over the years. I now own 12 of the Detroit Engines, As the years have passed by I have become even more interested in learning about Detroit Engine Works and its related companies. On this website you will find original literature and photos along with information that I have figured out from reading literature studying engines and photos. Most of the information has been gathered from original literature and should be fairly accurate. As time goes by I'm sure that more information will surface on Detroit Engine Works and it's related companies. Most people are not aware of these old gas engines and the roll that they played in our great nation here in USA and all over the world. On this website you will read about and see photos of some of the very early gas engines that were in some cases developed before the first gas powered automobiles. Gas powered Marine engines were being used all over the world in every size boat you could imagine. The stationary engines were used to power farm machinery such as corn grinders, water pumps, saw mills, cream separators, washing machines, light plants, concrete mixers, hoist, tractors, Etc.. I have added the paragraph below to this history page because I feel that most people may not be aware that it was the early Detroit marine & stationary engine companies and their employees that manufactured them who opened the doors for the Detroit automobile industry. Below is a quote from a book named Motormen & Yachting by author Michael M. Dixon. "The marine gas engine business may not be recognized as a great industry when compared to the automobile. However, as late as 1910, Gas Engine magazine observed that while much attention was being given to impressive numbers of automobiles being produced, the largely invisible gasoline marine engine still out numbered automobile engines in use by a factor of two to one. It was the impressive number of marine gas engines that prepared a generation of mechanics to establish Detroit's automobile industry." March 1909 Popular Mechanics Advertisement. Detroit Engine Works offices and factories were located on East Jefferson Ave in Wayne County Detroit, Michigan northwest of the Detroit river . Addresses on original literature & phone books indicate that Wadsworth Mfg Co. had multiple properties and buildings ranging in a span of five blocks between Mt. Elliot Street and Canton Street on the north side. South side properties and buildings span two blocks between Mt. Elliot St. and Meldrum Street. Later around 1915 time period Wadsworth Mfg. purchased land in the area of East Jefferson, Conner Creek & Kercheval Street. All these areas were excellent locations for the factories because ore and coal for the foundry could be shipped in by way of boat on the Detroit river or the railroad. The railroad was very close to the factories which made it great for shipping. DEW factories on Jefferson Avenue were owned and operated by the Wadsworth Mfg Co. who manufactured and sold carriage goods and hardware and eventually manufactured auto bodies, auto tops, auto parts and was located in the same facilities. 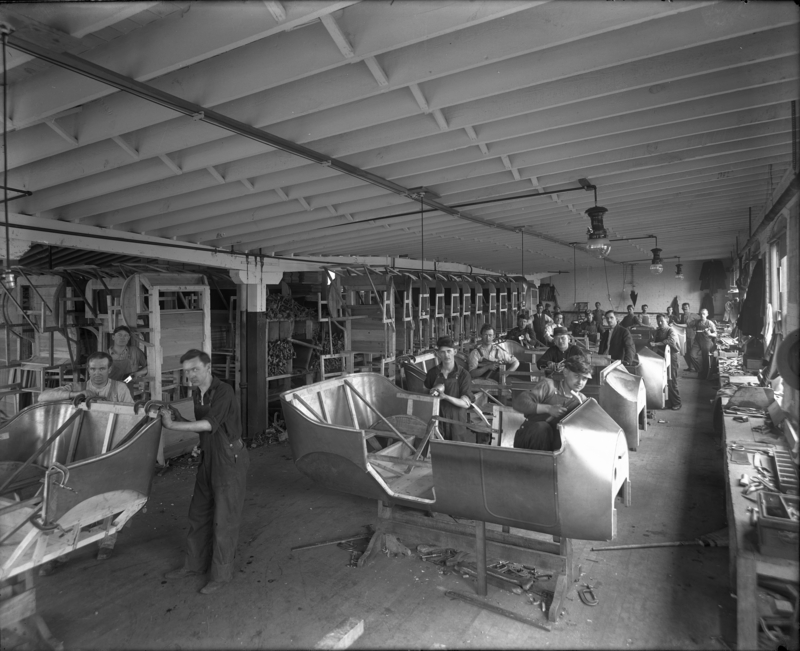 Wadsworth was supplying car bodies to many of Detroit ’s automakers including Ford and Wadsworth’s three neighbors, Hudson, Maxwell & Chalmers. 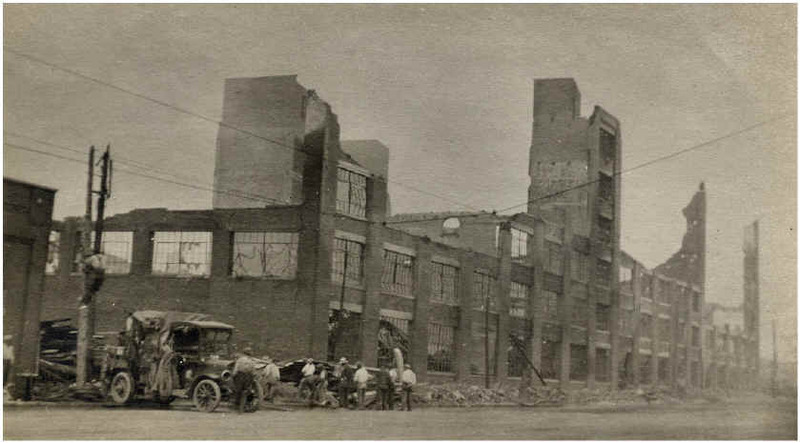 Wadsworth Mfg Co. operated multiple businesses on the side DEW, DMCSC, DBC, CEC, MSBC. were some of the firms that operated out of these same factories. Wadsworth Manufacturing and Detroit Engine Works owned and operated their own foundry and is believed to be one of the largest manufactures of engines and pleasure boats in the early 1900's. All literature & photo's copyrighted & protected by worldwide copyright laws. Photo's taken sometime between 1906-1914 courtsey of Burton Historical Collection Detroit Public Library. Photo above is of the older Wadsworth Mfg. Co. show room at 1256 East Jefferson Ave. located on the south side of Jefferson Ave. across the street from their newer factory and closer to the Detroit river. The four story building to the left of the show room was also part of the Wadsworth factory. The steel rails in the road were for electric street cars. Click on the photo to enlarge and notice the boats, engine and coach bodies that are on display through the plate glass windows. Sign on the side of the building shows the direction of the Morgan & Wright Tire Co. behind the show room. Originally from Chicago, the Morgan & Wright Bicycle Tire Co., moved to Detroit to in 1906 and built it's 900,000 sq ft complex on a portion of the former Old's Motor Works parcel, east of the Wadsworth plant. 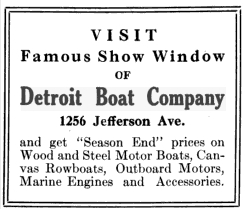 Below is 1914 advertisement for Detroit Boat company advertising their famous show window on Jefferson Ave. New street address for the Wadsworth Mfg. Co. show room now would be 6656 East Jefferson Ave. The old Morgan & Wright Tire Co. was sold to US. Tire Co. in 1914 and then later became Uniroyal Tire Co.. In 1980 Uniroyal announced it would be closing down the riverfront plant. Later that year the City of Detroit purchased the Uniroyal plant and land in hope of developing the river front property. The Uniroyal buildings were completely demolished in 1985. Today the still vacant land offers a clear view of the river and Belle Isle. The city of Detroit is currently in the process of building a river walk all the way from Mt. Elliott St. to Grand Blvd.- Belle Isle bridge. Detroiter Magazine, Volume 5 & 6, 1914. DEW had distributorships in London England located at 94 Hatton Garden and another office & warehouse about 15 miles away at Holborn. The Holborn office & warehouse was advertised as the Columbia Engine Company with their main offices located at 1273-1285 East Jefferson Ave. Detroit, Michigan. Very little is known about the London dealerships. DEW engines at the Detroit factory. H. Scherer & Co. establishes the Detroit Motor Car Supply Co. 1904. DMCSC new cinder block building was constructed between Bellevue Street and Concord Street at the corner of Jefferson Ave. and Bellevue Street. current address would be 6601 East Jefferson Ave. were there is now a Wendy's hamburger fast food business. (Jefferson Ave. was re-numbered in 1921). It has been stated that a very old building that is currently located at 6533 East Jefferson Ave. is the old Detroit Motor Car Supply Co. building and that it is still in use today as an apartment building called (The Lofts at Rivertown). This is a false statement. The building located at 6533 East Jefferson is not the old Detroit Motor Car Supply Co. building. It is the old Frederick Stearns & Company building built in 1899. Photos exist of this building Circa 1910-1915 and yes it is currently an apartment building called (The Lofts at Rivertown). "Detroit Motor Car Supply Co. - A large exhibit of automobile clothing for all weathers, automobile accessories and supplies, was made. Particularly seasonable were the robes and weatherproof coats shown. This concern manufactures automobile bodies, tops, tire cases, clothing, caps, storm aprons, dash clocks, wind screens and other automobile accessories. The company claims to be the largest manufacturer of automobile bodies in the United States, and had in the Armory an exhibit of several up-to-date styles of coupe, landaulet and limousine bodies. A special runabout top, complete with side curtains, storm front and body irons, appealed particularly to the users of small cars." During the mid-teens Wadsworth Manufacturing offered a very successful "Full Vision Sedan Top" for Model T Touring Cars, a lined and insulated top very similar to the all-weather convertible tops offered by the Springfield Metal Body Co. and others. 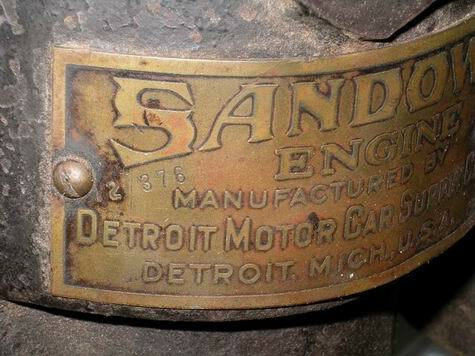 In later years Detroit Motor Car Supply Co. was listed as a manufacturer of commercial bodies for Fords, but they were also were manufacturing and distributing two cycle stationary and marine gasoline engines called "SANDOW". The engines looked very similar to the DEW engines but did have some differences. Detroit Motor Car Supply Co. advertised that there engines were not sold to jobbers, dealers or agents. (Direct plan of selling, No middle man, straight from factory to user). Savings was passed on to the user. The success of Hugo Scherer’s various business interests can also be attributed to his friend and business partner, Frederick Elliott Wadsworth (1868-1927). Wadsworth was born in Durham , Middlesex County, Connecticut to James W. Wadsworth, a member of one of Connecticut’s most prominent families. After a public education Frederick attended university after which he made his home in Detroit, Michigan . Wadsworth and Scherer organize the Detroit Engine Works in the early 1900's and Wadsworth was instrumental in the formation of the National Can Company, serving on the firm’s board of directors for a number of years. Surprisingly, National Can’s Detroit plant produced auto parts in addition to tin cans. Located at 2566 East Grand Blvd. The firm produced ‘Mayo’ and ‘National’ brand radiators under the Mayo patents as well as other stamped, sheet-metal auto parts. National’s radiator business was eventually purchased by the McCord Radiator & Mfg. Co. Wadsworth’s experience in metal stamping proved helpful when he and Scherer got into the boat and auto body building business and Wadsworth’s deep pockets helped finance the pair’s business ventures, which included the following: Columbia Engine Company, Detroit Boat Company, Detroit Engine Works, Detroit Forging Company, Detroit Motor Car Supply Company, Michigan Steel Boat Company, St. Clair-Athol Rubber Company and the Thrall Motor Company. Detroit Engine Works, Detroit Motor Car Supply Co., Columbia Engine Co. and Thrall Motor Co. manufactured 2-cycle marine and stationary engines rated between 2- and 50-hp. Also offered by Detroit was a range of light kerosene-powered 6-to 18 hp Wadsworth farm tractors. Detroit Forging specialized in drop-forged automobile parts, specifically convertible top hardware. St. Clair-Athol Rubber Co. manufactured rubber coated automobile fabrics that were also used in convertible tops. Michigan Steel Boat Co. and Detroit Boat Co. manufactured boats which more often than not were powered by engines manufactured by the Detroit Engine Works. Not surprisingly, all of the above firms were located either in the same factory or same vicinity of East Jefferson Ave, all were operated under the auspices of the Wadsworth Mfg Co. Wadsworth Mfg Co. was also known for manufacturing automobile bodies, tops, and accessories for Detroit’s automakers, many of whom were also conveniently located along East Jefferson Ave. The Wadsworth factory was located adjacent to a siding of the Detroit Terminal Railway, which later on enabled them to get large contracts with the Ford Motor Co.
Scherer and Wadsworth organized the Detroit Engine Works in order to manufacture two-cycle engines for marine and agricultural use. The firm later produced a large number of products including light tractors, stationary engines, reverse gears and various other machined, drop-forged and cast-metal products. Scherer and Wadsworth marketed their engines under the Detroit Motor Car Supply Co. (Sandow), Detroit Engine Works and Columbia Engine Co. trade names. As early as 1902 the Detroit Engine Works was using 1256 East Jefferson Ave. , Detroit, as their main address however numerous addresses were used most of which indicated the same group of structures around the East Jefferson Ave. area (1036, 1236, 1242, 1250, 1252, 1256, 1263, 1271, 1273, 1287, 1314, 1315, 1375). Bellevue Ave. address (24, 66, 115, 171, 187, 213, 417, 361, 373, 420, 445). Also one address listed at 24 Beaufait Ave. Detroit. Just as it does today, Bellevue ran alongside the west side of the new (built in 1905) factory/office building located on the north side of East Jefferson. The firm continued to use the older factory located across the street on the south side of East Jefferson until it moved to Conners Creek. Located at 2700 E. Jefferson Ave. , just across the street from Wadsworth’s new plant in the Conner's Creek area was the main factory of the Chalmers Motors Co. Starting in 1917 Chalmers leased a portion of their facility to the Maxwell Motor Company for an initial five year contract. Scherer and Wadsworth were also partners in real estate. In 1903 they constructed a neighborhood of frame cottages in the summer resort of Grosse Pointe which became known as the ‘Cabbage Patch’. In 1916 Scherer formed the Hugo Scherer Land Co. to manage his various real estate holdings which included the Scherer Block ( 280-284 East Jefferson Ave. ) and a large commercial structure located at 936-944 Woodward Ave. Scherer and Wadsworth’s early business ventures shared the same downtown Detroit address - 280-284 Jefferson Ave (East) - as Scherer’s carriage supply firm. The pair’s second recorded business venture, the Michigan Steel Boat Company, was incorporated on December 27, 1901 with Hugo Scherer, president; and Frederick E. Wadsworth, secretary-treasurer. 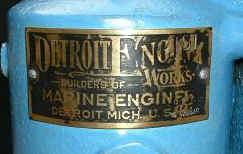 Detroit Engine Works pioneered the use of two-cycle engines for marine and stationary power use. Sources indicate that DEW started out as a marine engine manufacturing firm that eventually produced stationary gasoline-kerosene engines, traction engines and reverse gears and many other products. One style of engine that DEW produced was very unique due to being one of the first low pressure fuel injected engines invented back in the early 1900's. Manufactured sometime around 1907. This fuel injected engine was DEW's most popular engines produced due to the fact that it was designed to run on a multiple types of fuels. Gasoline, Kerosene (Coal Oil), Alcohol, Naptha, Distillate and no change in equipment was necessary to change from one fuel to another unless you wanted to run natural or artificial gas then a regulator adapter could be purchased. DEW advertisements claimed that their engines could start and run on most all fuels and in any climate including 40 degrees below zero temperatures. A 1910 advertisement in Popular Mechanics magazine stated that 35,000 Detroit engines are in use all over the country and giving the best and cheapest power ever known. DEW two cycle single cylinder two flywheel vertical stationary engines (tank cooled) were built in size's 2, 2.5, 3, 3.5, 4, 5, 6, 7, 8 horse power. The two cylinder two cycle two flywheel vertical stationary engines (tank cooled) were built in sizes 12, 18 and 20 horse power. All of the two cycle two flywheel stationary engines were sold with the low pressure fuel injection systems. Carburetors and mixers were not advertised for the stationary engines. In the first few years of production original DEW catalogs advertise their governed stationary engines only up to 8 horse power in size. However they advertise non-governing engines in sizes 2,3,3.5-4,5-6,7-8,10,12-14,18-20 horsepower. Most of the Non-governing engines were single flywheel marine engines that came mounted on a wooden base with a pulley between two pillow blocks. 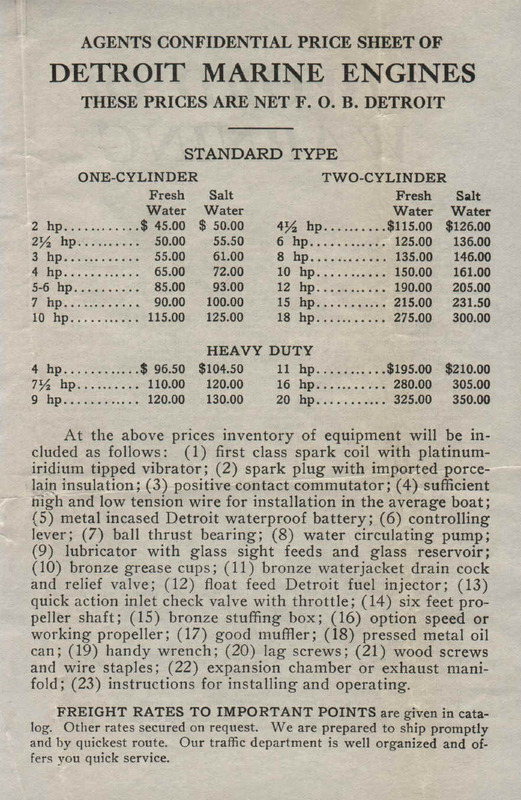 1915 Detroit Engine Works Stationary farm engine price list. DEW also sold Single cylinder four cycle hopper cooled horizontal stationary engines in sizes 1.5, 2, 3, 4.5, 6, 8 horse power. These four cycle stationary engines appear to have been manufactured by the Nelson Brothers corporation and tagged with DEW name tags. 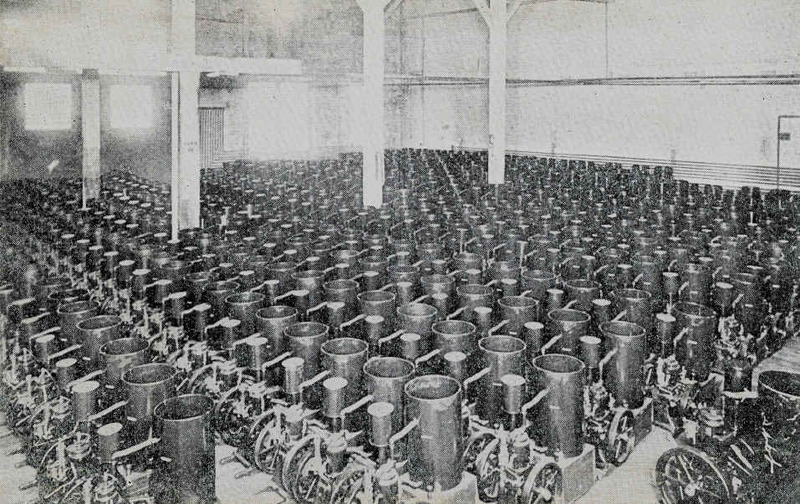 Some of these engines had (Detroit Engine Works, Detroit, Michigan) cast in large raised letters on top of the water hopper. Research shows that DEW, DMCSC & Columbia marine engines were offered in many different configurations over the years. An assortment of carburetors and mixers were manufactured by different companies, DEW, Schebler, Lunkenheimer, Essex, Krice, Planhard, Williams are just a few that are known to have been used. Ben J. Middleditch manufactured the first fuel injection systems designed by the Peterson Brothers John & Frederick and were used on the Detroit engines. Then DEW manufactured their own fuel injection systems, three different styles of fuel feeder-injectors in the proceeding years after. Two or three different styles of timing controllers were offered. A few different versions of condenser exhaust manifolds were produced. Flywheels with different configurations and different number and sizes of holes were produced. The DEW marine engines were offered in a range of different sizes depending on what year the engine was made. The 1910 single cylinder 2 cycle models were manufactured in standard sizes of 2, 2.5, 3, 4, 5-6, 7-8 hp and a single cylinder heavy duty 8-hp engine. The 1910 two cylinder two cycle models were offered in standard sizes 9-10, 12, 15-hp and heavy duty 20-hp or you could get their 20-hp special which was made for speed boats. The 1910 Four cylinder four cycle marine engines were built in sizes 20-25, 40-50 horse power and could be purchased with a reversible gear box and a Briggs and Stratton distributing system. See DEW marine literature section for the difference in standard, heavy duty and special engines. All the marine engines came with a five year guarantee and the option of fresh water or salt water fittings. The price sheet below is from around 1913 time period as you can see DEW now offered more marine engine sizes in single cylinder and two cylinder. Notice the small sizes they offered the two cylinder engines 4.5, 6, 8-hp. A large selection of generators and pumps were also available from DEW, sold by themselves or as a package unit with the engine. DEW entered the tractor business, building the Wadsworth tractor for several years. They also sold Power Machinery Accessories and supplies. Their catalog listed just about every kind of accessory you would ever want for a stationary engine, over 50 pages of items. It is not known how many of these items DEW actually manufactured. Research shows that DEW, DMCSC, CEC, DBC, MSBC, TMC were conglomerates that were owned and / or operated by the Wadsworth Manufacturing Co. and in the later years paricially operated by the Standard Motor Parts Co. with exception of the Thrall Motor Co.. At this time I do not have any proof that Caille Engine Co., Middleditch Engine Co., Bessemer Engine Co., American Engine Co., Arthur Colton Co., Petoskey Iron Works or any other engine company was part of this particular Detroit conglomerate. Although it is very possible that designs, parts, castings, etc.. were being sold or traded between the companies. Addresses & information found on original literature. 1236 Jefferson Ave. Detroit, Michigan. (Marine Advert). 1242 Jefferson Ave. Detroit, Michigan. (Marine Advert). 1395 Jefferson Ave. Detroit, Michigan. (1905 Marine Advert Recreation Mag Vol 24 Page 56). 1287 Jefferson Ave. Detroit, Michigan. (1906 Marine Advert Chautauquan Mag Vol 47). 1251 Jefferson Ave. Detroit, Michigan. (1906 Marine Advert Pacific Monthly Mag Vol 15). 1263 Jefferson Ave. Detroit, Michigan. (1907 Marine Advert). 1375 Jefferson Ave. Detroit, Michigan. (1907 Marine Advert). 1271 Jefferson Ave. Detroit, Michigan. (May 1907 Marine Advert Pop Mechanics). 1263 Jefferson Ave. Detroit, Michigan. (1908 Marine Advert Sports & Recreation Mag Vol 4 Page 70). 171 Bellevue Ave. Detroit, Michigan. (1909 Advert). 1271 Jefferson Ave. Detroit, Michigan. (March 1909 Marine Advert Pop Mechanics). 1314 Jefferson Ave. Detroit, Michigan. (1909 Marine Engine Advert McBride's Magazine). 24 Beaufait Ave. Detroit, Michigan. (Jan 1911 Marine Reverse Gear Advert Pop Mechanics). 40 Meldrum Ave. Detroit, Michigan. (Jan 1911 Marine Advert). 373 Bellevue Ave. Detroit, Michigan. (1911 Stationary Engine Advert Bee Culture Mag). 115 Bellevue Ave. Detroit, Michigan. (1911 Advert). 213 Bellevue Ave. Detroit, Michigan. (1910 Stationary Engine Advert Pop Mechanics Vol 14 Page 132). 213 Bellevue Ave. Detroit, Michigan. (1911 Advert). 1271 Jefferson Ave. Detroit, Michigan. (May 1911 Marine Advert). 1250-1280 Jefferson Ave Detroit, Michigan. (1911 Advert). 1319 Jefferson Ave. Detroit, Michigan. (1912 Marine Engine Advert Scribners Mag Vol 51). 116 Concord Ave. Detroit, Michigan. (August 1913 Stationary Engine Advert Farm Journal Vol 37 Page 454). 1256-1500 Jefferson Ave. Detroit, Michigan. (Jan 02,1913 Letter). 1036 Jefferson Ave. Detroit, Michigan. (Oct 1913 Tractor Advert Farm Journal Vol 37 Page 550). 187 Bellevue Ave. Detroit, Michigan. (1913 Advert). 361 Bellevue Ave. Detroit, Michigan. (1913 Advert). 271 Bellevue Ave. Detroit, Michigan. (March 1914 Stationary Advert New England Mag Vol 51 Page 247). 66 Bellevue Ave. Detroit, Michigan. (April 15, 1915). 373 Bellevue Ave. Detroit, Michigan. (March 15, 1915 Stationary Engine Advert). 1415 Jefferson Ave. Detroit, Michigan. (April 15, 1915 Marine Advert). 1250 Jefferson Ave. Detroit, Michigan. (1915 Phone book). 24 Bellevue Ave Detroit, Michigan. (Marine Advert). 115 Bellevue Ave. Detroit, Michigan. (Dec 12, 1916). 420 Bellevue Ave. Detroit, Michigan. (1916 Advert). 445 Bellevue Ave. Detroit, Michigan. (1916 Advert). Corner of Jefferson & Bellevue Ave Detroit, Michigan. (Advert). Kercheval & Conners Creek Detroit, Michigan. (1918 Phone book). 1723 Jefferson Ave. Detroit, Michigan. (1920 Rudder Marine Directory Trade List of Ship building). 94 Hatton Garden, London, E.C. England. Head Office and Works Detroit, Michigan, USA. 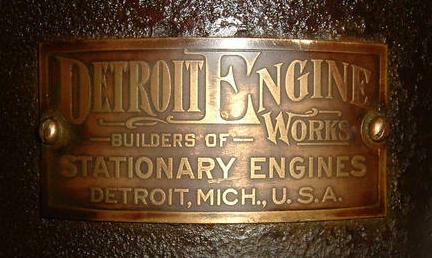 (Brass Engine Tag). DEW (Gear Dept) Manager Feb-08, 1910 J. B. Dovocau. DEW Sales Manager Jan-28, 1911, H. M. Fletcher. DEW General Sales Manager Oct-27, 1911, E. J. Ellis. DEW Sales Manager Jan-02, 1912, H. M. Fletcher. DEW (Marine Dept) Sales Manager 1913, E. H. Marlow. DEW General Sales Manager Jan-07, 1916, Fred W. Elliot. DEW General Sales Manager Feb-17, 1916, Fred W. Elliot. 280-284 Jefferson Ave Detroit, Michigan. (1903 Advert). 1256 Jefferson Ave Detroit, Michigan. (1903 Advert). 1252-1270 Jefferson Ave Detroit, Michigan. (1905 Advert). 1526 Jefferson Ave Detroit, Michigan. (1915 Advert). 1245 Jefferson Ave Detroit, Michigan. (1915 Auto Advert). 1256 Jefferson Ave Detroit, Michigan. (Auto bodies) (1915 Phone book). 1267 Jefferson Ave Detroit, Michigan. (June 15, 1916 Auto Advert). Jefferson & Conners Creek Detroit, Michigan. (Factory) (1915 Phone book). Detroit Motor Car Supply Co. (Sandow). Corner of Bellevue & Iron Street Detroit, Michigan. (Advert). 2 Canton Ave, Detroit, Michigan. (May 1910 Sandow Stationary Advert Vol 14 Page 131). Bellevue & Iron Streets Detroit, Michigan. (March-25-1911 letter). 2 Canton Ave, Detroit, Michigan. (May 1911 Advert). 2 Mt. Elliott St., Detroit, Michigan. (Jan 1911 Pop Mechanics Marine Engine Advert). 1258 Jefferson Ave Detroit, Michigan. (Dec-02-1912 letter). 1258 Jefferson Ave Detroit, Michigan. (Dec-14-1912 letter). 1258 Jefferson Ave Detroit, Michigan. (Dec-23-1912 letter). 1258 Jefferson Ave Detroit, Michigan. (Dec-30-1912 letter). 70 Canton Ave, Detroit, Michigan. (1912 Advert). 1258 Jefferson Ave Detroit, Michigan. (Jan-13-1913 Envelope). 88 Canton Ave, Detroit, Michigan. (1913 Advert). 4 Canton Ave, Detroit, Michigan. (April 1915 Advert Hunter-Trader-Trapper, Sandow Stationary Engine). 1250 Jefferson Ave Detroit, Michigan. (1915 Phone book). 72 Helen Ave, Detroit, Michigan. (1915 Advert, American Exporter Vol 77, pg 8). 136 Canton Ave, Detroit, Michigan. (1916 Advert). 5 Helen Ave, Detroit, Michigan. (Marine Advert). DMCSC Sales Manager Dec-02-1912, John Shoadley. 5 MT. Elliott Ave. Detroit, Michigan. (July 1912 Pop Mechanics advert). 17 Fuller St. Detroit, Michigan. (Dec 1911 Stationary Engine Adv ert Pop Mechanics). Jefferson & Bellevue Avenues Detroit, Michigan. (August 1911 Marine Advert). Jefferson Ave. East at Bellevue, Detroit, Michigan. (Feb 24, 1912 Letter). 1273-1285 Jefferson Ave. East Detroit, Michigan. (Feb 24, 1912 Letter). Holborn, London, E. C. England. (Feb 24, 1912 Letter). 547 Bellevue Ave Detroit, Michigan. (Oct-1915 Pop-Mechanics Magazine Advert). 1275 Jefferson Ave. Detroit, Michigan. (1915 Phone Book). 1256 Jefferson Ave Detroit, Michigan. (1918 Phone Book). CEC General Sales Manager Feb-24-1912, E. J. Ellis. 102 Mill St. Kalamazoo, Michigan. (Jan-June 1901 Advert, Recreation Magazine Vol-14). 280-284 Jefferson Ave, Detroit, Michigan. (1903 Advert). 1300 Jefferson Ave Detroit, Michigan. (1906 Advert). 1334 Jefferson Ave Detroit, Michigan. (1908 Advert). 1252 Jefferson Ave Detroit, Michigan. (1909 Advert). 156 Bellevue Ave Detroit, Michigan. (May 1911 Rowboat Advert). 1271 Jefferson Ave Detroit, Michigan. (1911 Advert). 1273 Jefferson Ave Detroit, Michigan. (1911 Advert). 1347 Jefferson Ave Detroit, Michigan. (1913 Advert). 1401 Jefferson Ave Detroit, Michigan. (19?? R.G.Dun's Review). 1415 Jefferson Ave Detroit, Michigan. (1905 Advert). Dubois & Guoin Detroit, Michigan. (1918 Phone book). Corner of Kercheval Ave & Conner Creek Detroit, Michigan. (1919 Advert). 9 Bellevue Ave Detroit, Michigan. (1907 Speed Powered Canoe Advert). 26 Bellevue Ave Detroit, Michigan. (1907 Speed Powered Canoe Advert). 156 Bellevue Ave Detroit, Michigan. (May 1911 Canoe Advert). 1100 Jefferson Ave Detroit, Michigan. (May 1911 Advert). 72 Bellevue Ave Detroit, Michigan. (1912 Canoe Advert). 1122 Jefferson Ave Detroit, Michigan. (1912Advert). 1151 Jefferson Ave Detroit, Michigan. (1912 Advert). 1154 Jefferson Ave Detroit, Michigan. (1912 Advert). 1117 Jefferson Ave Detroit, Michigan. (1915 Advert). 1147 Jefferson Ave Detroit, Michigan. (Jan-1915 Blue Bird Advert). DBC general sales manager, March-15-1912, M. A. Randall. DBC general sales manager, 1911, M. H. Rockwell. 584-590 Franklin Street Detroit, Michigan. (1915 Phone book). 584-590 Franklin Street Detroit, Michigan. (1918 Phone book). 245 Jefferson Ave, Detroit, Michigan. (1915 Phone book). 245 Jefferson Ave, Detroit, Michigan. (1918 Phone book). 105 Meldrum Ave. Detroit, Michigan. (Dec 1911 Engine Advert Pop Mechanics). The sketch below is of the DEW Factory's on Jefferson Ave Detroit, Michigan. which included WMC, DBC, MSBC and CEC. In this sketch DEW manufacturing facilities appear to be very large. One of the DEW advertisements claims their factories covered eight acres of land another later ad claims fourteen acres. It is not known just how accurate the pictures below are. Artist sometimes exaggerate these pictures for advertising. The street below with the rail car tracks in the middle is Jefferson Ave. in the background you can see the Detroit River. Building on the far left is the same building shown in the picture below this one. The factory below was built around the 1905 time period and located at the corner of 1256 East Jefferson Ave. & Bellevue Ave. on the north side of the street. New address 6601 East Jefferson Ave. (Addresses were re-numbered in 1921). Principals of the DEW in 1903 were Hugo Scherer as president and Frederick E. Wadsworth as secretary and treasurer. In 1911 Hugo Scherer was president of the firm with Frederick E. Wadsworth as secretary and treasurer. Scherer and Wadsworth also owned and managed the DMCS, TMC, and CEC. Both Scherer and Wadsworth were also the principals of the DBC which was located at the same facility and manufactured launches and canoes. Detroit Engine Works, Detroit Motor Car Supply Co., Columbia Engine Co., Michigan Steel Boat Co., Detroit Boat Co., Caille Perfection Motor Co., Middleditch Engine Co. and Bessemer two cycle engines are all pretty similar. 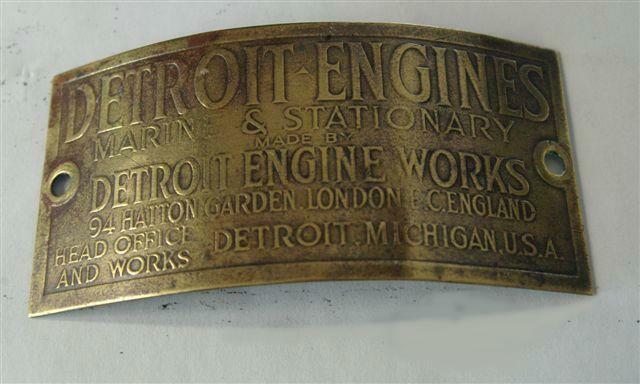 All of the companies were located in Detroit, Michigan with exception of Bessemer who bought out Middleditch Engine Co.
Below are a few photos of the engine tags that were used on Detroit Engine Works engines and some of the related engines. An original Columbia marine engine catalog illustrating their line of engines actually shows two or three pictures of their engines with Detroit Engine Works name tags attached to the cylinder. Original literature clearly illustrates that Detroit Engine Works manufactured two cycle engines for Columbia Engine Company, Detroit Motor Car Supply Company, Michigan Steel Boat Company and Detroit Boat Company. It is said that Benjamin J. Middleditch designed the two cycle explosion engine with its fuel injection system that made Detroit Engine Works and its related companies so popular back in the early 1900's. As of May 26, 2006 research has been done on patents listed under the Middleditch name from 1879 through 1925 and only one patent has been found (0577,739) issued to Benjamin J. Middleditch and Edward J. Frost and it is a device for regulating the quality of gas. This patent is for a fuel & air mixing chamber/reservoir which includes a float, ball & needle that regulates the amount of fuel and air allowed in the chamber while always maintaining the same quality of fuel & vapors going out of the chamber. This device appears to be almost the same design mixing chamber that is being used on many of the Detroit engines equiped with low pressure fuel injection systems, Peterson, DEW, DMCSC, Colton, Columbia, CPMC, MEC, BEC. While there has been no proof or patent found that shows Ben Middleditch designed this two cycle explosion engine and its fuel injection system. He was involved in the design of the mixing chamber/reservoir for the fuel injection system. He also manufactured some of the first fuel injection systems for the Detroit made engines. December 05, 2006, Through research I have discovered that there is a very good possibility that Ben. J. Middleditch either owned or had a license for the patent writes to patent # (840,178) for the universal fuel feeder that Middleditch Engine Co. and Bessemer Engine Co. used on their two cycle engines. The patent was originally submitted May 25, 1905 by Daniel M. Tuttle and patented on January 1st 1907. Photos of a early model Bessemer two cycle engine have surfaced with embossed patent dates. See 1915 infringement lawsuit below for the whole story. Benjamin Middleditch was born in 1859 in Amherstburg, Ontario Canada. Ben and his British born wife, Lucy H. Middleditch moved to Detroit in 1880 and started their own general machine shop business. Ben Middleditch became very popular in Detroit as a engineer and manufacturer of machinery and engines. He also bought and sold real estate on the side and made a substantial sum of money doing so. Ben and Lucy Middleditch had two son's who were well educated with college degrees and also attended the military. Lieutenant George O. Middleditch born in Detroit, Michigan on November 20, 1894. George was a pilot for the Royal Flying Corps 44th training Squadron. One day while testing a new plane something went wrong and the plane did a nose dive and crashed. Lieutenant George O. Middleditch died on March 12, 1918. The second son, Leigh B. Middleditch was a second Lieutenant in the field Artillery and was killed in a air battle over the trenches in France. Phillip Middleditch (Older brother of Benjamin Middleditch) was born in Amherstburg, Canada in 1856. Phillip was the proprietor of a company Petoskey Iron Works located at 315 State Street Petoskey, Michigan. City directories show PIW in the Petoskey area around the 1906-1910 time period. PIW's sold marine engines that looked very close to the marine engines that Detroit Engine Works produced. Benjamin Middleditch helped his older brother design and manufacture the company's first engines. This was a very small company that was only in business for a few years. PIW was also a sales agent for the Alamo Engine Co. The Petoskey Iron Works business was sold around the 1911 time period and the manufacturing of the Petoskey two cycle marine engines ceased. New owners continued in business as a repair shop and agent for Alamo engines. Phillip Middleditch died in 1914. By 1910 Benjamin Middleditch was manufacturing and selling his own design stationary and marine two cycle engines that looked very similar in design to the DEW engines. The engines brass tag was embossed with the Middleditch Engine Company name. MEC only manufactured these two cycle stationary & marine engines for a few years. In 1913 Bessemer Gas Engine Co. purchased the Middleditch Engine Co. of Detroit Michigan including its stock of engines, patterns, jigs, and patents. BGEC continued producing the two cycle engines with their own brass Bessemer Engine Co. name tags into the 1920's. BGEC also designed and manufactured a hopper cooled and air cooled version of the stationary style engines. Benjamin J. Middleditch died May 22, 1916 at the age of 57. Patent # 926,892 shows that John Peterson & Frederick O. Peterson designed the two cycle explosion engine with its fuel injection system. Although their patent was applied for on February 24, 1908 and patent issued on July 06, 1909 we know that their design and engine was already being produced by DEW at least a couple of years before the patents were issued. There is a original DEW catalog with a 1907 date showing the two cycle explosion engine with its fuel injection system. It is not known if John Peterson and Frederick O. Peterson were employed by DEW or MEC Ben J. Middleditch manufactured this fuel injection system for DEW. DEW also manufactured two cycle marine engines with a regular float type carburetors and mixer type carburetors before and after the fuel injection system was manufactured. DEW engineers eventually designed and manufactured their own fuel injection system. The one piece fuel feeder-Injector patent was applied for on January 7, 1911 was designed by Frederick Barthel. Patented May 14, 1912 (patent #1,026,425). Frederick Barthel, born: 1866, Died: 1922, Grave: Forest Lawn Cemetery Detroit, Wayne county, Michigan. 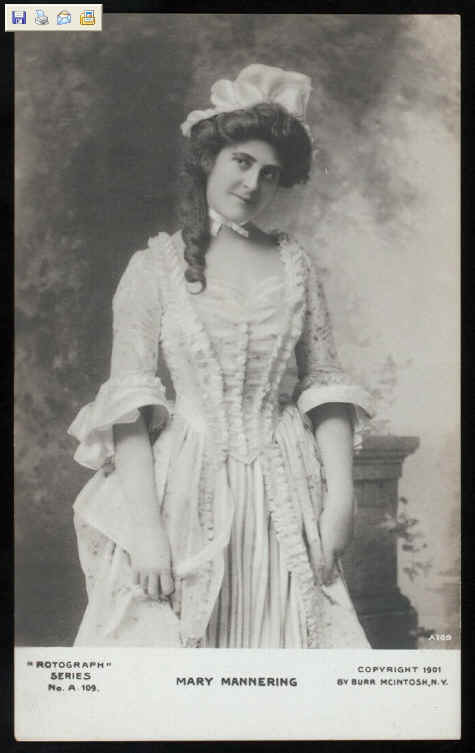 Wife: Ida Bowman. There were three styles of this one piece fuel feeder/Injector produced. See Identifying engines & parts section on the main menu for photos & info on the three different styles. Steam Magazine Volume 11 & 12 January 1913. Patents: University of Central Florida Library. The information in the paragraphs below were found in a 1915 original Bessemer two cycle engine catalog. I thought that this information might be of interest to other engine collectors. In a description of the Bessemer Universal Fuel Feeder this is what was found. "We have no intention whatever of taking recourse against the innocent purchasers of these infringements and consequently we do not issue the usual "warning" to that effect, but when considering the purchase of an engine it might be well to take the fact into consideration that, if possible, We intend to stop any and all infringements of our rights, and that if you buy an engine that is clearly such and we shortly thereafter stop the manufacture of it by law, the guilty firm would undoubtedly go out of business altogether or else take up the manufacture of a new type engine, in which case you would be forever unable to secure repairs for your engine in case of accident." "This device is one of the many things which puts the Bessemer Kerosene Engine in the lead, makes it a more expensive engine to build and consequently renders it impossible for us to compete with the cheap four cycle gasoline engines which are being turned out by the million and are made only to sell." I first read about this infringement of the Bessemer Universal fuel feeder a few years back when I was on a antique engine forum on the internet. A gentlemen named Arnie Fero from Pittsburg PA had posted the information and said it was a quote out of Bessemer two cycle engine catalog he had. I really wanted to get a copy of this Bessemer catalog and see if there was any more information on this subject and try to figure out who it was that was infringing on their patents. I knew that it probably involved Detroit Engine Works. The problem was Arnie's information had been posted in March of 2001 and I was now reading it in 2004. Another year went by and one night I was bidding on a Bessemer engine catalog on Ebay through the internet. I won the bid and just a few minutes or so after the auction I received a email from a fellow engine collector who was also bidding on the catalog but had lost the bid and wanted to know if it would be possible if he could purchase a copy of the catalog. I noticed his name was Arnie Fero, so ask if he was the gentlemen that posted the Bessemer fuel feeder infringement information on the antique engine forum a few years back. He indeed was the same gentlemen. So we worked up a trade and sent each other copies of our catalogs. I never did find any more information about this fuel feeder infringement until one day in 2006 I was going through some old digital photos I had collected over the years and I found a few photos of a very early Bessemer two cycle engine, one photo was a close up of some embossing on the engine inspection plate (The Bessemer, Grove City, PA). Another photo of the crank case showed embossed (Patended, January 1st 1907). After seeing the photos I thought this might be the answer I have been looking for. I went to the US patent website and searched through patents until I narrowed down where the January 1st 1907 patents started and ended. This took a little time and once I got this info there were still thousands of patents to be searched. So I got a friend of mine to help me search. After about a week or so we finished looking through all the patents for January 1st 1907 and found only one engine patent, # (840,178) by Daniel M. Tuttle, for January 1st 1907 and it did not look exactly like a Bessemer or Middleditch two cycle engine to me. I lost interest after this because I could not figure out what was going on. Why couldn't I find this patent? About six months later I was looking through some of my old literature and paper work and I come across a copy of this same patent that I printed out back when we originally found it. I looked at the patent again and this time I read all the pages and looked over the drawing closer. This was the same basic fuel injection design being used it was just drawn a little different. I knew that this was indeed the patent that Bessemer sold their engines under and probably the original patent for the low pressure fuel feeder for which the rights were originally owned by Daniel M. Tuttle. It appears that Ben. J. Middleditch may have acquired the rights to this patent at some point. I have no hard evidence of this but the fact remains that the design of this low pressure fuel injected engine seem to follow Ben J. Middleditch from factory to factory no matter what company he worked for. Daniel M.Tuttle, Middleditch, Bessemer fuel feeder patent # (840,178) January 01, 1907. John Peterson & Frederick O. Peterson, DEW fuel feeder patent # (926,892) July 06, 1909. Frederick Barthel, DEW second fuel feeder patent # (1,026,425) May 14, 1912. Source: Iron Age Magazine Volume 90 page 1149, November 14, 1912. "The Bessemer Gas Engine Company, Grove City, Pa. has purchased the gas engine business of the Middleditch Engine Company, Detroit, Michigan, including its stock of engines, patterns, jigs and patents. In addition it has bought the patents of John Peterson and Frederick O. Peterson, covering the Universal fuel feed, which enables small engines to operate successfully on kerosene, naptha and low grade distillates. The Bessemer gas Engine Company has felt the need for some time of a line of small engines to make its line more complete, and this purchase gives it a full range of gas engines from 2 to 350 hp." Detroit Engine works and its related engine companies were still manufacturing engines and fuel feeders under Frederick Barthel's patent # 1,026,425 up until about the 1919 time period. This may have been why the law suit was filed by Bessemer. 1912,1913,1915 original Detroit Engine Works letterheads. Original company literature 1907 through 1917. 1915 original Bessemer engine catalog. (Donated by Arnie Fero). University Of Central Florida computer patent search program and microfiche. Research done by: (John C. Davis), Davis Antiques & Scale Models. Wadsworth builds "Flying Fish" Hydro-Aeroplane. Detroit Engine Works sells plant to United States Tire Co. 1915. By 1915 the firm had grown to include these managers and officers: Hugo Scherer, President; Frederick E. Wadsworth, Secretary and Treasurer; H. E. Cronenweth, General Manager; W. C. Rowling, Purchasing Agent; and A. M. Ratigan, Advertising Manager. The Original Wadsworth plant at 1252-1270 E Jefferson was purchased by the United States Rubber Co. (manufactured the United States Tire), as was the former Hupmobile/King plant at 1300-24 E. Jefferson (at Concord). 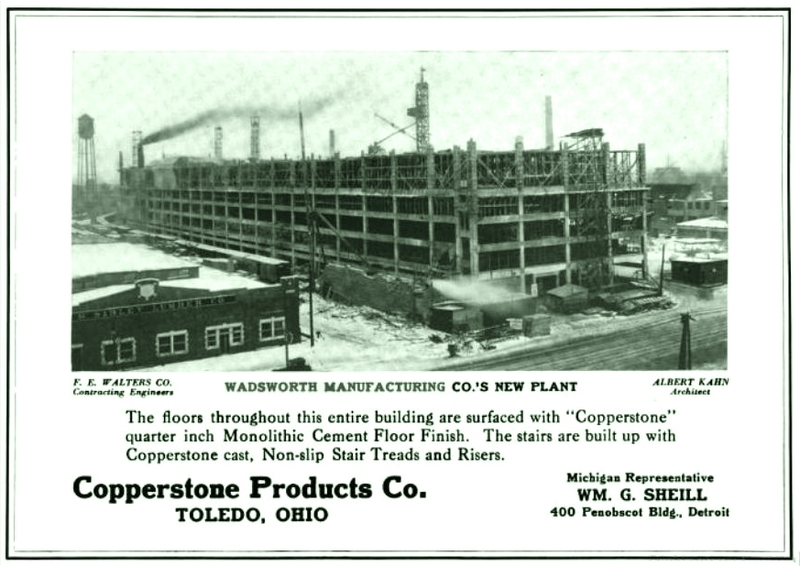 Wadsworth Manufacturing Co.'s New Factory built 1915. Morgan & Wright was purchased by the United States Rubber Company in 1914. US Rubber wished to expand the existing plant and made a generous offer for the original Wadsworth Manufacturing Co. complex. With the proceeds Scherer and Wadsworth purchased a large undeveloped plot on Jefferson Ave. 3 miles east of the current facility in the area known as Conners Creek. The Sibley Lumber Company and the Inside Inn Hotel was located just across the street. 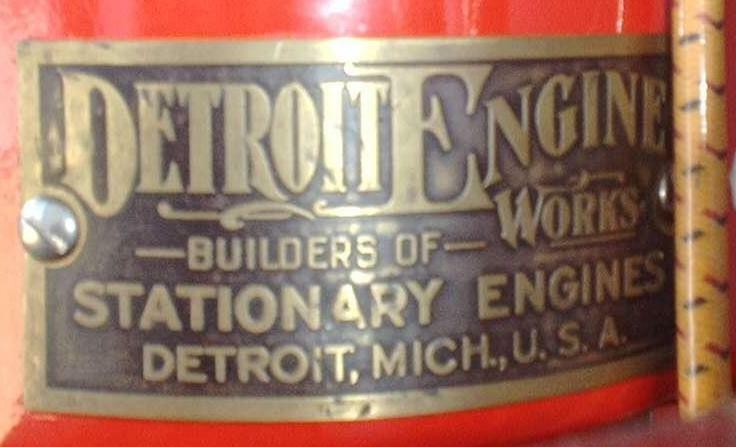 Detroit Engine Works, Detroit Motor Car Supply Co., Columbia Engine Co. were still manufacturing engines at this time and Michigan Steel Boat Co., Detroit Boat Co. also continued to manufacture boats. 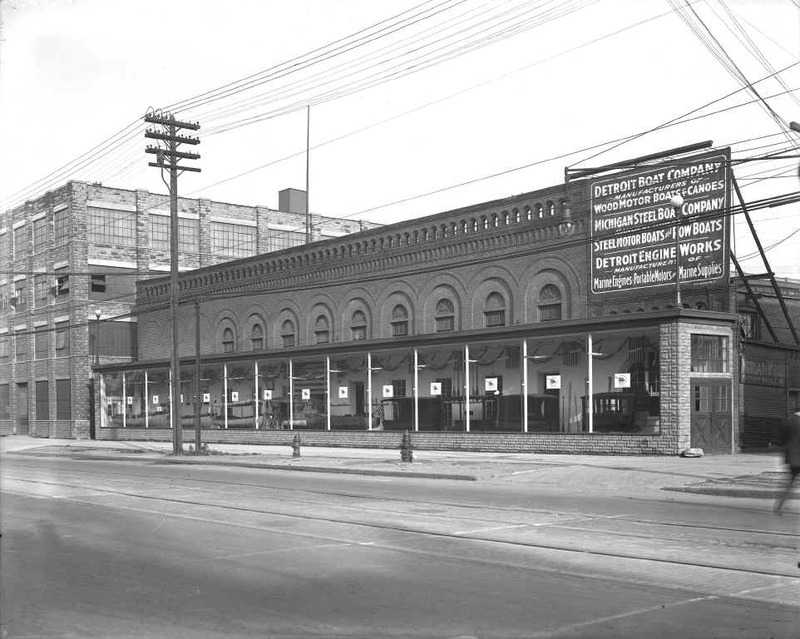 Located on the north side of East Jefferson Ave. and Conners Street the new facility featured a railroad siding connected to the Detroit Terminal Railway, which gave them direct access to Ford Motor Co.’s Highland Park and River Rouge assembly plants. Plans were drawn up by Detroit architect Albert Kahn and construction of the new modern facility - which was bordered by Kercheval Street to the north and Corey Place to the west - commenced in 1915. The new factory had 700,000 square feet of floor space. In June of that year the firm reported that they had spent $30,000 on new construction at the Conners Creek factory. 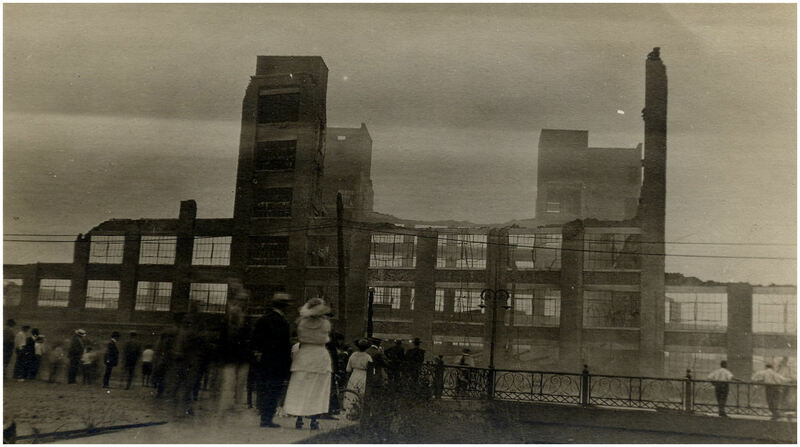 The photo above shows the Wadsworth Mfg Co.'s new six story factory as it was being built in 1915. The new address as listed today would be 12262 Kercheval Street Detroit, Michigan. This is the same basic location as the Kercheval Chrysler plant. June 10th, 1915 issue of the Iron Age magazine reported that Frederick E. Wadsworth, secretary and treasure of the Michigan Steel Boat Company, the Detroit Engine Works and Detroit Motor Car Supply Company, has purchased property 300 x 1200 ft, in the Fairview factory district, Grand Rapids, Michigan as the site for a new factory. It is understood that the construction of a four-story factory 240 x 260 ft, will be started at once. The building is to be used by a new company in the manufacture of motor car bodies. It is not known if this factory was ever built in the Grand Rapids area. No information or addresses have surfaced at this time. Wadsworth’s new Vice-president, Henry E. Bodman, was closely associated with both Packard and Ford and it is believed he represented the automakers interest who at that time owned a substantial portion of Wadsworth Manufacturing’s stock. Prior to his marriage to Mannering, Wadsworth purchased an estate in Irvington on the Hudson river in New York and in 1916 announced that he intended to live in New York permanently and was putting his Grosse Pointe estate on the market. 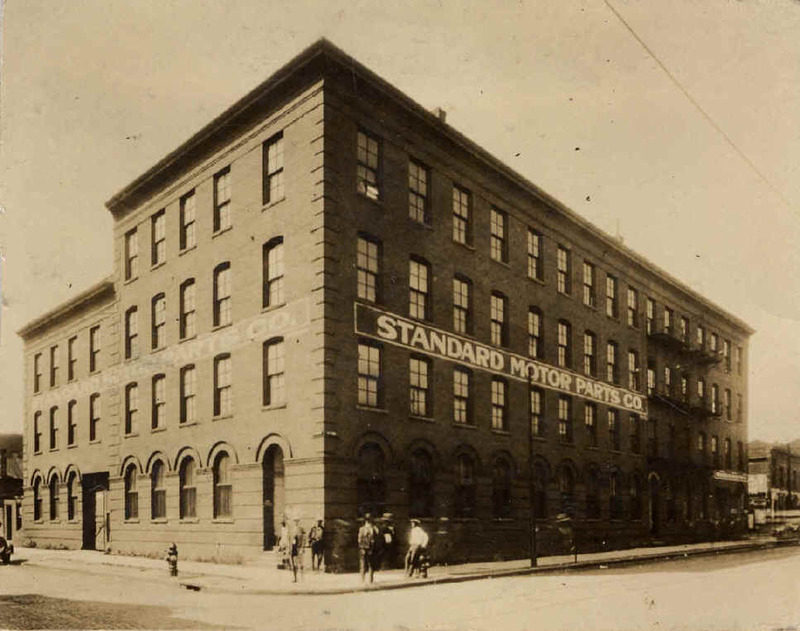 to Standard Motor Parts Co. 1918. DEW, DMCSC, DBC, CEC & MSBC All were ran as a side issue by the WMC, Which was primarily in another line of business. (manufacturers of auto bodies, auto tops and auto parts). As consequence the service on the repair parts became badly demoralized, and to protect the engine owners radical changes had to be made. Wadsworth management decided to transfer these companies to the Standard Motor Parts Company. It is not known if these companies were sold or if Standard Motor Parts Co. was just paid to manage them and/or the parts and service departments. Located at 584-590 Franklin St , Detroit, Standard Motor Parts specialized in providing service and spare parts to owners of bankrupt, orphaned and obsolete automobile, tractor and small engine manufacturers. Originally located in Kalamazoo, the firm was founded by Edwin J. Dayton who relocated the firm to Detroit in the early teens. The firm prospered, eventually establishing service depots in Syracuse, New York, Cleveland, Ohio, Lebanon, Muncie, Newcastle, Indiana, Chicago and Illinois. DEW, DMCSC, DBC, CEC, MSBC went out of business shortly after the transfer around 1919-1920 time period. This is the same time period that Wadsworth Manufacturing Co. was succeeded by the American Motor Body Company. Also in this time period is when the Wadsworth factory auto workers union went on strike and then the suspicious fire that totally destroyed the factory. Address & info listed for Standard Motor Parts Co. in the 1918 City directory, E. J. Dayton, Pres. and Treas. ; W. S. Grant, Sec. Manufactures of Auto Parts at 584-590 Franklin Street Detroit, Michigan. Photo courtsey of Burton Historical Collection Detroit Public Library. The SMPC headquarters in Detroit was incorperated March 12, 1915. Edward J. Dayton was born in Kalamazoo Michigan August 5, 1887, a son of Edwin Charles and Mary (Joy) Dayton. In Mr. Daytons early years he worked for a paper mill in Kalamazoo for 7 years and was identified with that business. Soon after he became involved with SMPC in Kalamazoo for a time and eventually moved to Detroit starting his own branch which he owned the controlling interest and has since been president of the company. From its inception the undertaking proved a success and as the years have passed it has developed rapidly until the business assumed extensive proportions. The Detroit plant is the headquarters of the company, SMPC also maintained service stations and likewise operate branch establishments at syracuse, New York; Cleveland, Ohio; Lebanon, Muncie and Newcastle, Indiana; and Chicago, Illinois. Mr. Dayton gives his close personal attention to the details of the business, the developement of which is a most excellent tribute to his ability to see clearly its larger aspects. Original Standard Motor Parts Company, Detroit, Michigan mail out flyer from 1917 period. (Donated by David Clark from Missouri Ozarks ). Scott M. Peters, Collections Historian Michigan Historical Museum. 1918 Detroit City Directory, published by R. L. Polk & Company page 1647.
www.1847usa.com (US Stamps) used to date Standard Motor Parts Co. flyer. Letter from Ford Motor Co.
Detroit June 2, 1910 – Two new automobile companies have been formed here during the past week. They are the Hupp-Yeates Electric car Company, $100,000 capital, which will build a new type electric and a concern headed by Hugo Scherer and F.E. Wadsworth of Michigan Steel Boat Company which will have a capitalization of $250,000 and which will build a small car of more horsepower, about 100-inch wheelbase, to weigh under 1,900 lbs. This car will sell for under $1,000. This building at the corner of Bellevue street, is for Hugo Scherer and F.E. Wadsworth, who have formed a new company to build a low-priced car. However, there is no evidence the vehicle ever made it past the prototype stage, and even the existence of a prototype is doubted. An Online Encyclopedia of American Coachbuilders & Coachbuilding. Wadsworth Strike April 18, 1919 & Fire August 1, 1919 cost millions. Fire in Detroit does over a million in damage. “Detroit, Michigan, Aug. 2.—Damage estimated at more than $1,000,000 was caused last night when the Wadsworth Manufacturing plant, in the east end of this city, was almost entirely destroyed by fire and other business houses slightly damaged. The fire is thought to have been caused by combustion, and originated in the paint shop of the Wadsworth company. The Sibley Lumber company suffered $100,000 loss and the Inside Inn hotel was totally destroyed. Wadsworth Mfg Co. located at East Jefferson Ave. & Kercheval St. (Conner Creek area). 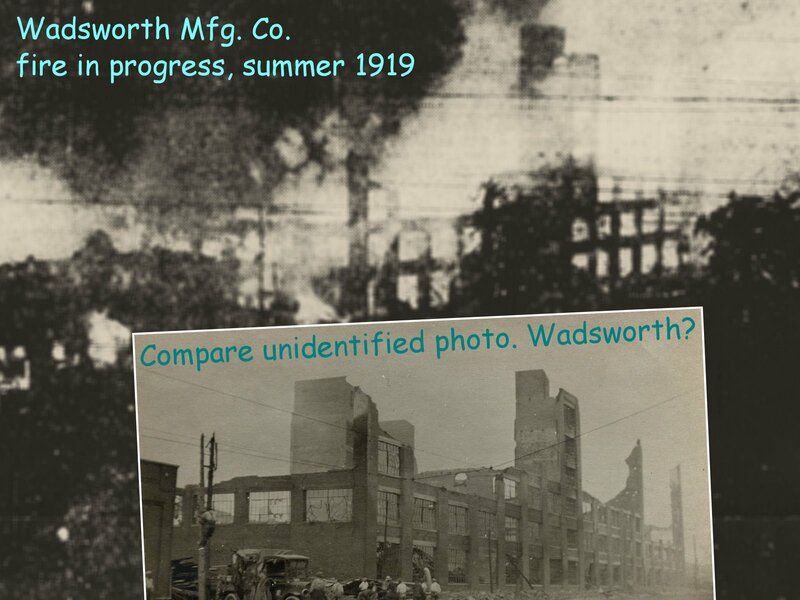 of the actual Wadsworth factory fire so a comparison could be made between the two buildings. After the Wadsworth factory fire a 1919 issue of Safety Engineering Magazine stated that the No. 6 building was 6 stories in height and divided into 3 sections by 12 inch single fire doors operated by fusible links. The building was filled with highly flammable contents and had automatic sprinklers fed from a 50,000 gallon water tank up above the roof on a tower. The fire occurred on one of the upper floors and spread through the wall openings in the different sections, the result being the opening of a large number of sprinklers that without doubt the water in the sprinkler tank was quickly exhausted, after which the fire had it's own way, and the final loss was about $1,250.000. The reason the sprinkler system failed was because the 12 inch fire doors were not fully automatic and sufficient enough. If these doors had automatically closed the fire would not have spread so quickly and more then likely would have allowed the sprinkler system to put out the fire. In December of that same year (1919) the Wadsworth home at Grosse Pointe Farms was burned. No information on what caused the fire. The house was rebuilt and remodeled only to be destroyed again from a fire two years later (Aug 19, 1921) when the house was struck by lightning during a thunder storm. House valued at $150,000. The Wadsworth family were at their summer home in Nantucket Massachusetts each time the two fires occurred. Detroit News paper, Detroit public Library. Research done by: John Davis, Davis Antiques & Scale Models. T.K. Sand : (Before My Time) two photos from T.K. Sand grandparents. 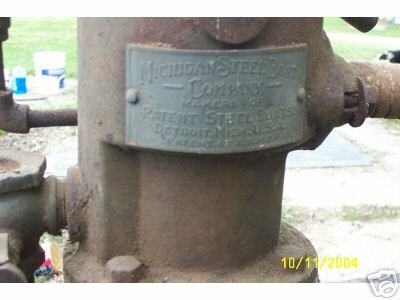 Although the firm had transferred its marine, stationary farm engine and parts service to Standard Motor Parts Co., Michigan Steel Boat Company continued to be listed in the Detroit directories at the Corner of Kercheval Ave & Conner Creek, the same locations as Wadsworth Manufacturing. At that time Michigan Steel Boat’s officers were as follows: Frederick E. Wadsworth, president; Mary M. Wadsworth, vice-president; H.E. Cronenweth, treasurer. American Motor Body Co. purchases Wadsworth Mfg Co. Nov of 1920. The American Motor Body Co. was created by the American Can Company as a Delaware Corporation on February 18, 1918. The purpose of its founding was the eventual take over of the plants and assets of two firms, the Wadsworth Manufacturing Company of Detroit, Michigan and the Hale & Kilburn Corp. of Philadelphia, Pennsylvania. American Can’s Detroit plant was located at 1400-1500 Trombly St. , (the same facility sometimes used 6234-6290 Russell St. as its address), National Can’s plant was located at 2566 E Grand Blvd. At that time Hale & Kilburn was controlled by J.P. Morgan & Co. interests and like Wadsworth , was involved in producing automobile bodies. American Can’s president, Frederick S. Wheeler, hoped the two related business would give his firm a foothold in the emerging all-metal automobile body building business. Hale & Kilburn’s president, Joseph A. Bower, spearheaded a re-organization of the firm during 1917 in hopes of attracting a buyer. When the project was finalized in January, 1918, he was rewarded with a promotion to vice-president of the J.P. Morgan’s Liberty National Bank of New York . The American Motor Body plant in Detroit ran along the north side of Jefferson Ave, with its northern border running along the south side of Kercheval St/Ave. it was commonly known as the Kercheval plant. Both Jefferson and Kercheval were re-numbered by the City of Detroit in 1921, which gave the plant a new address; 12262 Kercheval Ave, Detroit, Michigan. On September of 1920 the stockholders of the Wadsworth Mfg. Co. accepted a plan whereby, that company would be taken over by the American Motor Body Corporation. The $1,000,000+ merger, included the plant and assets of the Hale & Kilburn Corp. of Philadelphia . The transaction was finalized on November 17, 1920 when the assets of Wadsworth were conveyed, subject to all liabilities to the American Motor Body Co. with the shareholders of Wadsworth Mfg. Co. receiving in exchange a portion of the capital stock of the American Motor Body Co. (American Can Co.), secured by a first mortgage on the Wadsworth plant located at Kercheval and Conners Creek, Detroit. A similar arrangement was made with the Hale & Kilburn shareholders in Philadelphia. July 1, 1923 the American Motor Body Corporation, under the direction and control of Charles M. Schwab, succeeded the American Motor Body Company. September 4, 1925 the purchase of the Detroit plant of the American Motor Body Corporation by the Chrysler Corporation was announced by Walter P Chrysler, Chrysler’s chairman and President. According to the press release. PALM BEACH Florida, March 27, - Frederick Elliott Wadsworth, retired automobile body manufacturer of Detroit City and Irvington-On-Hudson, died today at his winter home on Clarke Avenue here of a paralytic stroke. He was 58 years old. Stricken a week ago, his physicians said there was no hope and advised Mrs. Wadsworth to notify relatives of the sickness. Besides Mrs. Wadsworth, Mrs. Stanley Robinson of Pasadena, Cal., a daughter; Horace Wadsworth, a son, and Mrs. Frederick George of Grand Rapids, a sister, were with MR. Wadsworth when he died. Mrs. Wadsworth was formerly Mary Mannering, the actress. Mr. Wadsworth was a son of James W. Wadsworth of Durham Conn. He was formerly Secretary and General Manager of the Michigan Steel Boat Company of Detroit. Mr. Wadsworth married Mary Mannering, former wife of James K. Hackett, in this city on Jun 1, 1911. Mr. Wadsworth’s first wife was Luella Peck, niece of former United States Senator Burrows of Michigan. The Retired Detroit Manufacturer Was the Husband of Mary Mannering, the Actress.